William Clark, and nearly four dozen men that made up the Corps of Discovery, started upstream on the Missouri River to meet up with Meriwether Lewis on May 20, 1804. They had been commission by Thomas Jefferson, the year before, to find a water route to the Pacific and explore the uncharted West. Jefferson believed the team would find mammoths, volcanoes and salt mountains. What their eyes actually beheld, during their journey, was no less boggling. They interacted with nearly 50 Indian tribes, observed 300 species unknown, at the time, to science and then there were the Rocky Mountains! Aboard a 55 foot long keelboat and two smaller pirogues, they charted, mapped, studied nature, and kept copious notes and journals of their experiences. By the end of that July, they had traveled more than six-hundred miles, all while not once crossing path with an Indian. But things changed come August. 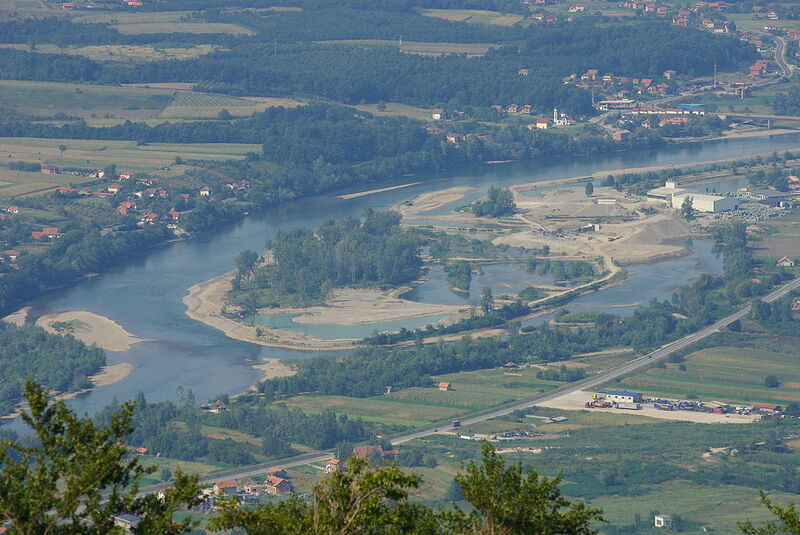 As a precaution, the Corps camped on river islands when possible and had guards posted at night. On the eve of August 2nd, Oto and Missouri Indians arrived at their camp. This first encounter actually went well. But, they had been warned, by President Jefferson, that the Sioux Indians would be another story. The first and only death of a member of the Corps occurred on August 20th. Sargeant Charles Floyd became the first soldier to die west of the Mississippi, most likely, from appendicitis. At month’s end, the group had reached the Great Plains, which was well stocked with beautiful elk, deer, buffalo and beaver. They were now headed into Sioux territory. The first encounter was with Yankton Sioux, who were fairly peaceful, more so than the Teton Sioux a bit farther up the river. 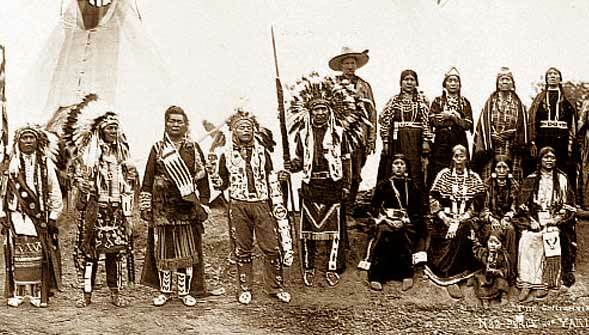 The Corps were prepared to exchange gifts, but the Teton Sioux showed ill-disguised hostility. A Teton chief demanded a boat as exchange for passage. The Indians became further threatening until Clark pulled his sword and Lewis aimed the keelboat’s swivel gun on the tribe. As quickly as tensions mounted, they subsided, but the Corps never did achieve a friendly rapport with the Sioux. As winter approached, they left their enemy behind them and headed further up the river. They continued to travel until the Missouri River began to freeze. Four days after the first snowfall, they reached the villages of the Mandan tribes. They wintered there, immediately building a fort to protect them from the fierce winter and potential attack by the Sioux. The expedition kept occupied by repairing equipment, trading with the Indians, and hunting for buffalo as their food supply began to dwindle. Lewis and Clark learned much from the Mandan and Hidatsa tribes. It was here that the expedition hired Toussaint Charbonneau, a French-Canadian fur trapper living among the Hidatsa who would serve as their interpreter. Charbonneau, his Shoshone wife, Sacagawea, and their baby son, Jean Baptiste, traveled with the expedition when it left Fort Mandan. 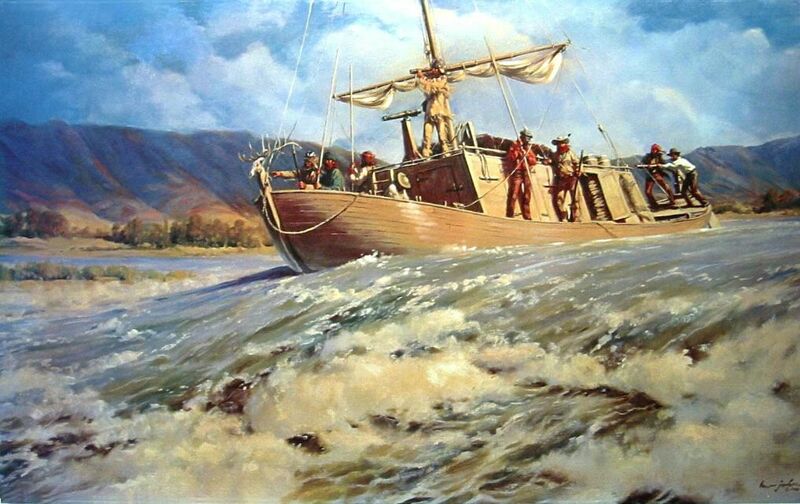 Lewis and Clark dispatched a dozen expedition members, 108 botanical specimens, 68 mineral specimens, and Clark’s map of the United States aboard a keelboat bound for St. Louis. The items would eventually be presented to President Jefferson. Using six dugout canoes and two larger pirogues, the remaining team loaded supplies and equipment and ventured where no American had ever gone. For the first time since the journey began, Lewis and Clark were headed due west and into grizzly country. 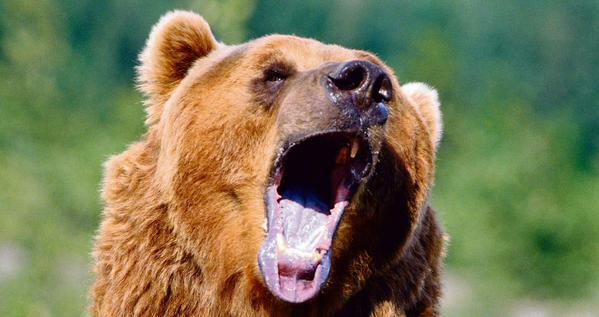 Although warned by the Indians about the powerful grizzly, Lewis felt a bear would be no match for a man with a rifle. But an encounter on April 29th changed his mind. It was on that day that Lewis and several other party members spotted a pair of grizzlies. They wounded one of the bears, which managed to escape. But the other charged at Lewis, causing him to flee 80 yards before he and one of his colleagues were able to reload and kill the bear. In early May a surprise gust of wind caught the sail of one of the pirogues, tipping the vessel over on its side. The quick reflexes of Sacagawea, who was riding in the vessel, preserved precious journals and supplies that otherwise would have been lost. 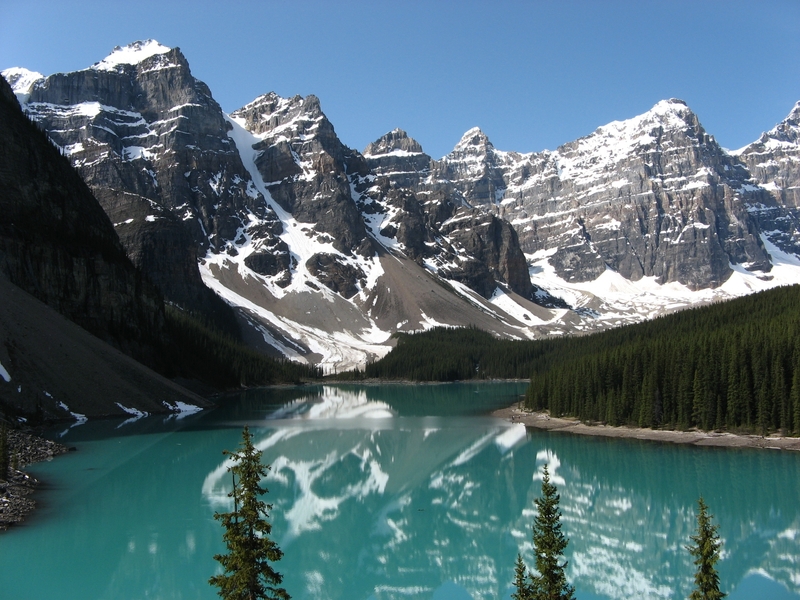 During the last week of May, Lewis caught sight of the Rockies for the very first time. He was filled with awe – which was immediately tempered at the realization of what lay ahead – to traverse the amazing mountain range would be no small feat. Progress became slow as the group made its way along a bending and shallow river filled with sharp, jutting rocks. On June 3, 1805, the Corps came upon a fork in the river. The branches of the fork were of equal size. It was believed by the captains that the southern branch was a continuation of the Missouri. They hoped this would lead them to be able to cross the Rockies before the first autumn snow. The rest of the Corps, however, disagreed, believing that the north fork was the way to go. The Mandan Indians had spoke of Great Falls. Scouting parties went along each branch in search of the landmark that would guide their way. 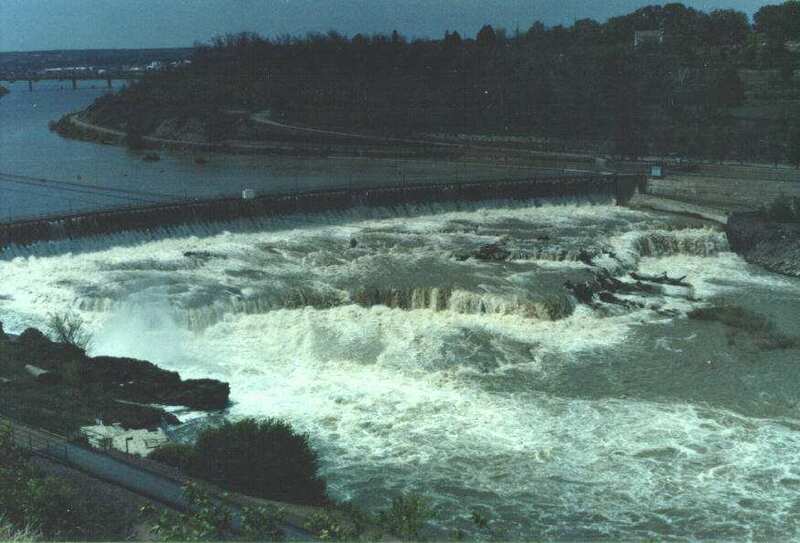 On June 13 Lewis became the first white man to see the Great Falls of the Missouri River. But to his dismay there were five separate falls, not one and they went on for a 12-mile stretch. Making their way around the falls was going to take some time – more than they had planned. On June 22, the hardest physical task of the trip thus far began. More than a month would pass before the party made their way around Great Falls as the Rocky Mountains loomed larger on the horizon. Once across the Continental Divide, they could ride the westward-flowing Columbia River. But the trek from the Missouri River to the Columbia River would require horses. To secure horses, the Corps would have to find the Shoshone tribe. 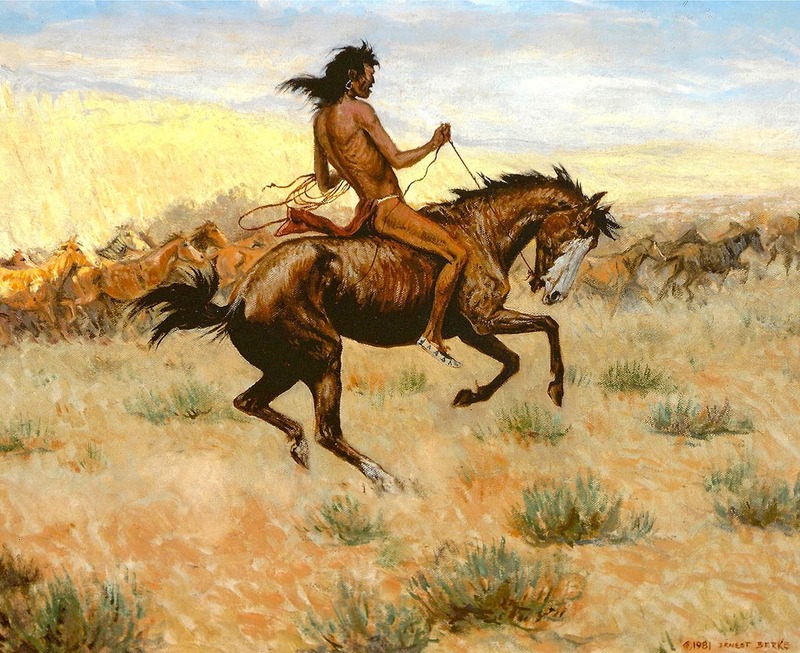 On August 11, Lewis spotted an Indian on horseback that turned out to be, at long last, a Shoshone, and the first Indian they had encountered since Mandan. 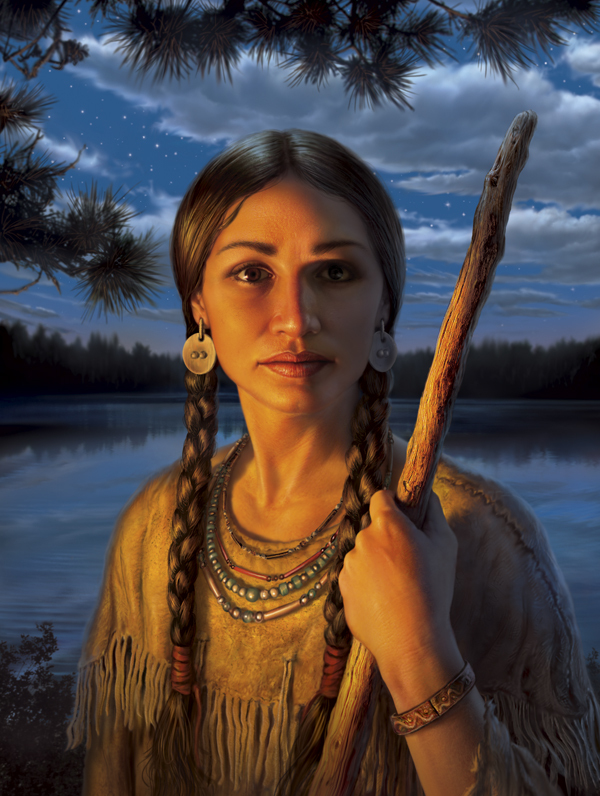 The Shoshone led the expedition to his chief, who, as the best of luck would have it, turned out to be Sacagawea’s brother. With Sacagawea translating, the bargaining began with Chief Cameahwait for horses. Without these horses, their chances of reaching the Pacific were nil. So, what was the price of a horse? At first, a knife and an old shirt. But the price went up every day until Clark had to offer his knife, his pistol, and a hundred rounds of ammunition for a single animal. And even then most of the horses were in terrible health. Information was also secured from the Shoshone. 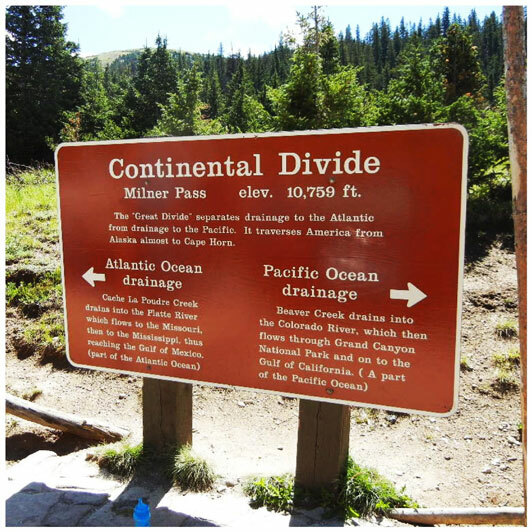 An old member of the tribe described a trail that led across the Continental Divide which was paramount to find a way over the mountains. Snow was already falling as the expedition set off for the Continental Divide. Game was scarce and food supplies were low. 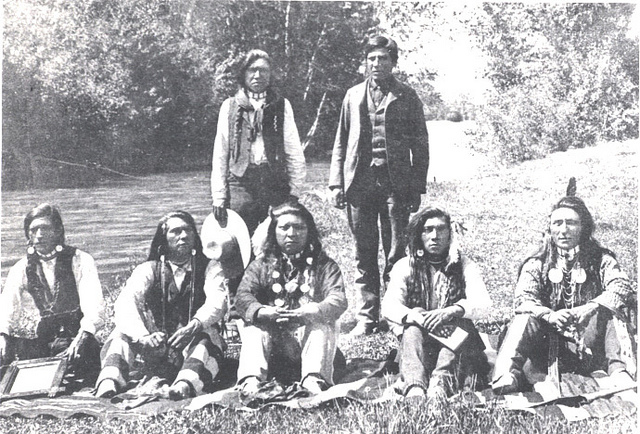 After passing over the divide into the Bitterroot Valley, the team came upon a band of Flathead Indians from whom they were able to secure more horses. Crossing the Bitterroot Mountains tested their endurance. After 11 days the horses were near starvation, and the men were too, resorted to eating three colts. Upon emerging from the mountains, contact was made with the Nez Perce, where the expedition procured dried fish and roots for their sustenance. In the middle of November, the men eagerly scanned the rolling waves of the ocean for the masts of ships that might carry them home. Spying none, they realized they would be spending the winter on the coast. One trade ship stopped to barter with the Indians while the expedition was present on the coast, but the Corps was never informed. The team was anxious to go home, but timing of the journey back was critical. They could only go once the snow had melted. If they waited too long, the Missouri would be frozen and they would be required to endure a winter on the plains. They spent their time at Fort Clatsop in monotony, making moccasins, buckskin clothing, working on maps, writing in journals and eating elk meat and roots. The rain was constant. The day that began their return occurred on March 23, 1806. Chinookan Indians were a constant concern via their continual attempts to steal supplies. Getting around the falls was a great a challenge. The expedition abandoned their boats and headed over the mountain with horses acquired from the Walla Walla tribe. The expedition arrived in Nez Perce Indian territory almost out of food. They had to wait for the weather to improve before trying to cross the snow-covered Bitterroots. The men lived on a diet of dried fish and roots, with occasional meat in the form of deer, elk, horse and dog. By early June the expedition was equipped with fresh horses and ready to continue east. Against the advice of the Nez Perce, Lewis and Clark left Camp Choppunish. Spring had begun on the plain, but it was still winter in the mountains where they encountered snow ten feet deep and packed so hard even the horses did not sink. They returned to the Nez Perce Indians for help. The Indian guides helped them to traverse the mountain range. On June 30, after reaching Traveler’s Rest, Lewis and Clark split up. Lewis took nine men to explore the Marias River. Clark and the remaining members of the Corps headed to the Yellowstone River. A skirmish, with Blackfeet Indians, resulted in the death of two Indians. Lewis and his men covered 120 miles, not knowing if the Indians were giving chase. Meanwhile, Clark and his group descended into Crow territory. The Crow were known as the great horse thieves of the Plains. 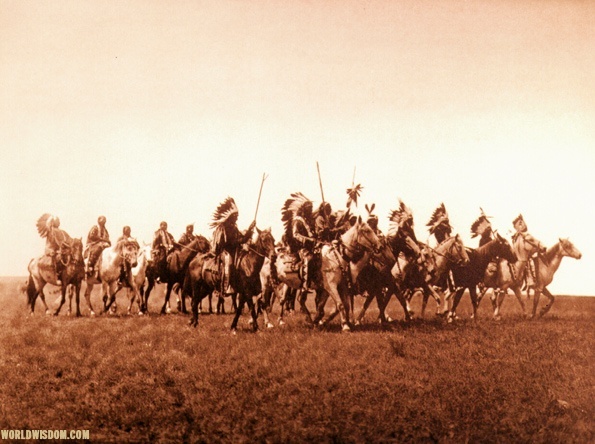 On July 21, the party arose to find half of their horses gone, although they never saw a single Indian. On August 11, Clark, mistaken for an elk, was shot clean through his left thigh. The wound was painful and took a while to heal, but not fatal. 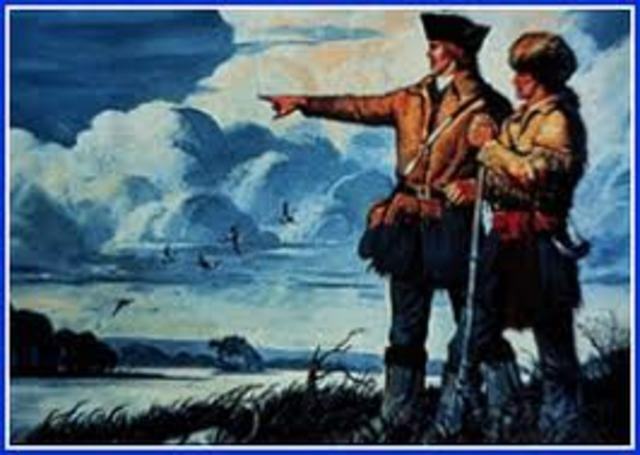 Lewis and Clark reunited and traveled the swift current of the Missouri River back to the Mandan Village, where they bade farewell to Sacagawea. In Teton Sioux territory, the expedition encountered threats and taunts. As they ran into traders, they were told that the expedition had been given up for dead. Two years, four months and ten days after they first left, the Corps of Discovery entered the Mississippi River on their way to St, Louis. One-thousand people lined the shore to greet the returning team with gunfire, salutes and an enthusiastic WELCOME HOME!.